BREAKING: People In The UK Actually Watch Ads On TV! According to the latest research conducted by Censuswide, 88 per cent of viewers across the UK do actually watch the adverts on live TV. The survey, commissioned by live ad insertion specialist Yospace, measuring the appetite and attitudes towards TV advertising in the online world, revealed that rather than avoiding ad breaks audiences actually want to see adverts that are personally relevant to them. The study questioned 2001 consumers from 17 major cities around the UK and showed that 78 per cent would be more likely to take notice of adverts during live television if they were personally targeted. In addition, one in five viewers want adverts that are relevant to where they live and exactly one fifth said they would be more interested if the ad was relevant to their age group. 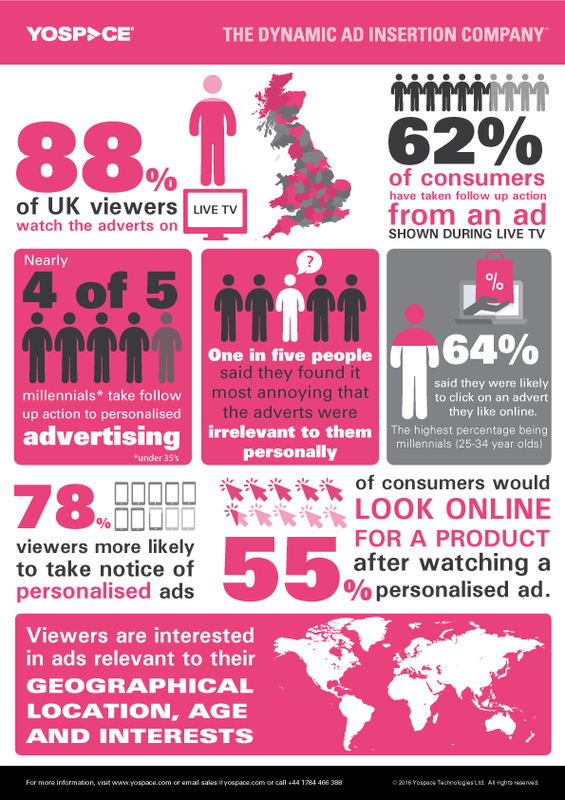 The survey, albeit UK-based, still provides an interesting insight into consumer views and behaviours surrounding live television and the power of personalised advertising, enabled by the advent of online streaming, revealing that personally relevant ads are more likely to prompt action from audiences. Fifty-five per cent of consumers said they would either be likely or very likely to look online for the product if an ad was targeted towards them personally, while more than three quarters said they would be likely to some degree to look in store for the product, or ask friends about the product advertised. In fact, 62 per cent of consumers said they had already taken follow up action after seeing an advert while watching live TV and more than one third had done so on several occasions. Viewers in the 16-24 age range scored the highest when it came to taking follow up action – with 73 per cent saying that they would look online for the product. But even with these cracking results for advertisers on the telly, the research also highlighted that viewers have a low patience threshold for poorly operating advertising. One quarter of respondents stated they would consider switching channel if there were technical problems with adverts on live TV and 19 per cent said they would think less of the broadcaster. Tim Sewell from Yospace said, “Opinions were very strong in the survey, particularly among the younger audiences who will have a significant influence on advertising trends in the future.